Designed with a unique expandable gusset system, the D3 FlatPack is an assault pack that can go from an almost flat profile when compressed to 750 cubic inches when completely expanded. The D3 FlatPack PLUS is a Hybrid Bag that bridges the gap between a small assaulter pack and a full sized day pack. With a slightly larger capacity and full peel open design, the Flatpack PLUS paves the way for full customization. The main gusset has #10 YKK zippers on both sides for independent access and web handle for accelerated opening both sides. A range bag. A discreet carry bag. 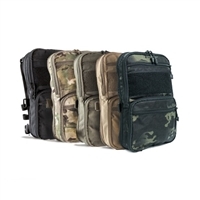 The perfect organizer for your pelican case. The Incog™ Rifle Bag is all of the above.